Senator Gregorio B. Honasan was born on March 14, 1948 in Baguio City to Colonel Romeo Honasan and Alice Ballesteros, a teacher from Sorsogon. His elementary years were spent at San Beda College in Manila where he was a consistent honor student and accelerated from grade 4 to grade 6, and the Dominican School in Taipei, Taiwan. He graduated with honors at Don Bosco High School in Mandaluyong and took up Economics at the University of the Philippines. He then went on to the Philippine Military Academy, where he graduated as “Class Baron,” the recipient of the institution’s highest leadership award. In 1981, he took up his Masters Degree in Business Management at the Asian Institute of Management (AIM), where he graduated with distinction, in his masteral thesis. As a solider, he saw action in Luzon, Visayas and Mindanao and earned a number of medals, awards, decorations and commendations for gallantry in action including three Distinguished Conduct Stars, Gold Cross medals and Wounded Personnel Medals sustained in combat. In 1985 he was recognized as one of the Ten Outstanding Young Men given by the Philippine Jaycees. In 1986, he was one of the principal players of the EDSA revolution as one of the leaders of the RAM (Reform the Armed Forces Movement) that broke away from the martial law government. He was awarded the Presidential Commendation Medal for Government Service by then President Corazon C. Aquino. 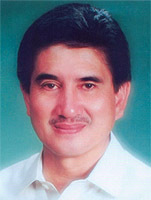 He became Senator in 1995, the first truly independent candidate in Philippine political history to win in national elections. He was re-elected in 2001, and again in 2007. He is principal author and co-author of, among others, the Clean Air Act of 1999, Clean Water Act, the National Security Policy, Disaster Risk Reduction Management Act of 2009, the Solid Waste Management Act of 2000 and the Comprehensive Agrarian Reform Program Extension with Reforms Law (CARPER). He is shepherding the Freedom of Information Act which he now refers to as the POGI Bill – People’s Ownership of Government Information Act, the National Mapping and Resource Authority Law and the Land Use Act. Senator Honasan has also proposed a Mini-Marshall Plan for Mindanao to help jumpstart economic development, peace and order, and political unity. The proposal will also help end centuries of armed conflict and terrorism. Senator Honasan is currently the Chairperson of the Senate Committees on Agrarian Reform, Public Order and Dangerous Drugs, and Public Information and Mass Media. He likewise chairs three oversight committees, specifically the Congressional Oversight Committees on Agrarian Reform and Dangerous Drugs, as well as the Joint Oversight Committee on the Human Security Act. He is Vice-Chairperson of the Senate Committees on Local Government, Civil Service and Government Reorganization, Health and Demography, National Defense and Security, Public Works, Rules, and Amateur Sports Competitiveness and a member of 19 major permanent committees and ten oversight committees. Senator Honasan is for God, Country and Family as core principles of citizenship coupled with values of Faith, Hope and Love. He is a staunch advocate for the environment, social reforms, national security, good governance, education and public health, youth and sports development recognizing that as a proud sovereign nation our most strategic and precious resource are our children. He is married to Jane Umali of Pagsanjan, Laguna, a medical technologist by vocation and an interior designer by training. They have five children and three grandchildren.